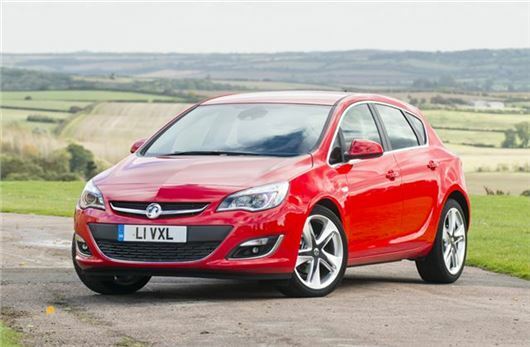 UK Car Discount has the following large range of competitive deals on brand new 14 plate Vauxhall Astra hatchback models. All cars are UK dealer supplied with full 100,000 mile ‘lifetime’ warranty and free delivery in mainland UK. The 2014 new Vauxhall Astra Sri features 17-inch five-spoke alloy wheels, lowered sports suspension, 3 spoke leather covered steering wheel, sports front seats, front fog lights, multi-function trip computer, chrome-effect side window surround and centre console surround ambient lighting. The 2014 new Vauxhall Astra Elite features 17” ten-spoke alloy wheels, 3 spoke leather-covered steering wheel, automatic windscreen wipers, automatic lighting control with tunnel detection, electro-chromatic anti-dazzle rear-view mirror, front fog lights, dual-zone climate control, leather faced seats, heated front seats , ergonomic sports front seats with extendable cushions and rear electric windows. The 2014 new Vauxhall Tech Line features 17” 10-spoke alloy wheels, a sat nav system with 7 inch colour screen, seven premium speakers, USB connection with iPod control, mobile phone support with Bluetooth, DMB digital radio, shark-fin aerial, chrome-effect exterior side window surround, multi-function trip computer and 3 spoke leather-covered sports steering wheel. For more Vauxhall deals visit www.uk-car-discount.co.uk. There are also excellent deals on Mokka and Insignia.